The latest new and improved version of the LivePlan app is now live. This is an important milestone for us. Sure, it marks the 28th major release since our spring 2011 launch, a pace we’re pretty proud of. More importantly, though, this release introduces our newest innovation—the “LivePlan Pitch” feature. After several months of planning and coding, we are excited to see it in action. We think you’re really going to like it. 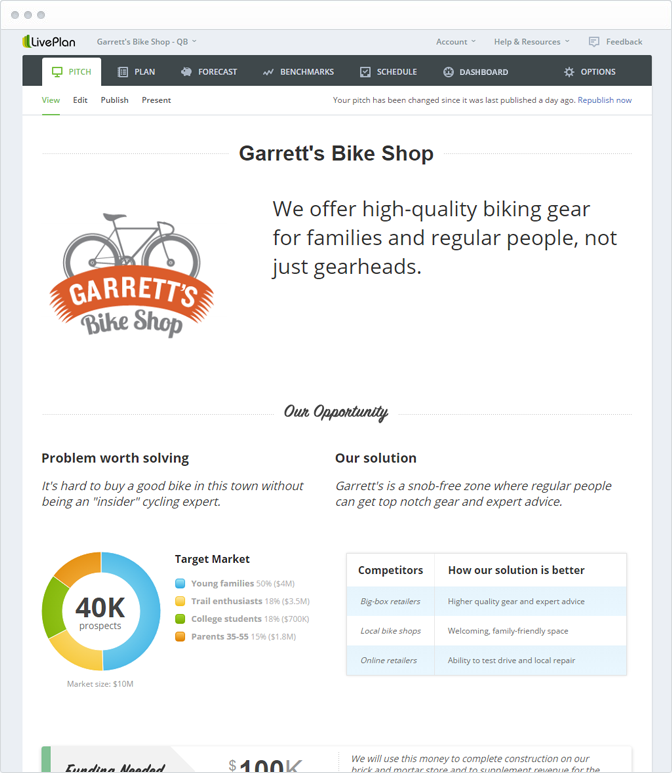 Our new Pitch feature is a visual way to organize, communicate, and track the key elements of your business. What problem do you solve, and for whom? What alternatives do your target customers have? What level of sales and profit are you projecting? Who’s on your team and why? The Pitch shows all of this and more in an attractive visual form that is understandable at a glance. What can you do with the Pitch? We started this project with the idea of a “visual executive summary.” Think of how the right infographic is able to quickly communicate the essence of a long article or report. We wanted to do the same for business plans—to complement the written detail and numbers with a concise summary of the most important points. Without a doubt, we’ve read some great traditional executive summaries over the years. Much more often than not, though, summarizing prose with more prose—however well crafted—proves to be time consuming and inefficient for writer and reader alike. One of the first rules of storytelling is, “Show, don’t tell.” The Pitch helps “show” what’s most important in the story of your company. As proponents of the Lean Startup movement have said so well, new companies are not just tiny versions of larger companies. The challenge with a startup is not just to execute well on a proven business opportunity. Its mission to experiment and learn and adjust in the earliest stages until it finds a suitable opportunity to scale up. The Pitch can help you identify potential business models, test the various assumptions involved, rework your model as things work or don’t work, and find the business opportunity that is going to provide the right path to success. Detailed planning is a great exercise in thinking about the challenges of your business. Once you shift into execution mode, though, plan documents can be hard to keep up to date. We make that as easy as possible in LivePlan. With the Pitch and our other Lean Planning tools, though, you have another option. You can combine a clear view of your strategy in the Pitch with a solid set of financial projections, a milestone schedule, and the LivePlan Dashboard, and easily track your progress as your business grows. With the right tool set, it’s easy to keep a growing business on plan, and to recognize when it’s time to adjust your business model or strategic goals to keep your planning fresh and relevant. Ready to give it a try? Just open your business plan, or start one if you haven’t already. Then go to the new Pitch tab and click the big button to get started. The Pitch Builder will walk you through each section of your Pitch. You can see what your Pitch will look like by clicking the View tab. You can share your Pitch with people you know by clicking the Share tab and following the instructions to publish your Pitch as a web page with a secret link that only you (and anyone you send it to) will know. You can read more about the Pitch feature here: https://www.liveplan.com/blog/2012/12/3-lean-planning-tools-in-1/. As always, we are eager to hear from you—what you like, what you don’t, what you hope we’ll tackle next. Drop us a quick note anytime. Just click the Give Feedback button at the top of the app anytime. It only takes a moment. Thanks, and happy planning!